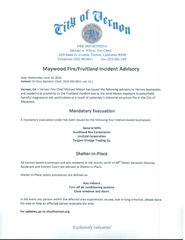 Vernon Fire Chief Michael Wilson has issued the following advisory to Vernon businesses and residents in proximity to the Fruitland Incident due to the wind-blown exposure to potentially harmful magnesium ash particulates as a result of yesterday's industrial structure fire in the City of Maywood. All Vernon-based businessess and any residents in the vincinity north of 49th Street between Downey Road and Everett Court are advised to SHELTER-IN-PLACE. In the event any person within the affected area experiences nausea, eye or lung irritation, please leave the area or help an affected person evacuate the area.